Lee Kennedy was born on January 1, 1934, in Louisville, Kentucky. He was commissioned through the Air Force ROTC program at the University of Kentucky on May 30, 1955, and went on active duty beginning August 31, 1955. Lt Kennedy completed Undergraduate Pilot Training at Vance AFB, Oklahoma, and was awarded his pilot wings in November 1956, and then completed helicopter pilot training in March 1957. He flew SH-19 helicopters at Oxnard AFB, California, from March 1957 to March 1959, and then completed Weapons Controller training before serving with the 4640th Support Squadron at Norton AFB, California, from December 1960 to August 1962. His next assignment was as an EC-121 Warning Star pilot with the 963rd Airborne Early Warning and Control Squadron at McClellan AFB, California, from August 1962 to June 1966, with deployments to Southeast Asia in 1965. After completing CH-3C Jolly Green Giant upgrade training, Capt Kennedy served as an HH-3E rescue helicopter pilot with the 38th Aerospace Rescue and Recovery Squadron at Tan Son Nhut AB, South Vietnam, from August 1966 to August 1967, followed by service as a CH-3E pilot with the 1042nd Test Squadron at Dover AFB, Delaware, from August 1967 to July 1970. He next served with the 5040th Helicopter Squadron at Elmendorf AFB, Alaska, from July 1970 to July 1972, and then on the staff of Headquarters Alaskan Command from July 1972 to June 1975. 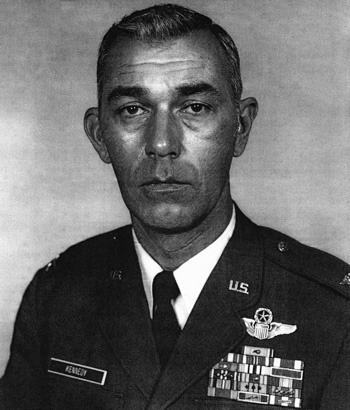 Col Kennedy served as assistant director of the Region Control Center for the 21st Air Division at Hancock Field, New York, from August 1975 to September 1976, followed by service as assistant deputy commander for operations of the 602nd Tactical Air Control Wing at Bergstrom AFB, Texas, from October 1976 to October 1978. 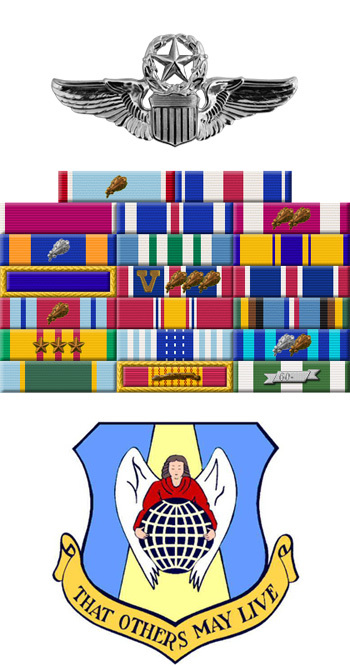 He returned to Elmendorf AFB and served with Headquarters Alaskan Air Command from October 1978 to December 1982, and then served as deputy director and then director for operational plans and support with Headquarters Tactical Air Command at Langley AFB, Virginia, from December 1982 until his retirement from the Air Force on October 1, 1985. Lee Kennedy died on December 28, 2003, and was buried at Arlington National Cemetery. Captain Leland T. Kennedy distinguished himself by extraordinary heroism in connection with military operations against an opposing armed force as an HH-3E Helicopter Pilot in Southeast Asia on 20 October 1966. On that date, Captain Kennedy successfully recovered six downed American airmen. Despite the intense, accurately directed, hostile fire which damaged his own unarmed rescue helicopter, Captain Kennedy, with indomitable courage and professional skill, chose to land next to a disabled companion helicopter and retrieve the crew, plus a previously rescued wounded F-4C pilot. With undaunted determination, Captain Kennedy then, amid hostile fire, sought and successfully recovered the second downed F-4C pilot. Through his extraordinary heroism, superb airmanship, and aggressiveness, Captain Kennedy reflected the highest credit upon himself and the United States Air Force.